We’re celebrating on Saturday, but I can’t let the day go unmarked. I LOVE Thanksgiving. It’s not even really eating the food, but I love making it. I love being in the kitchen with other people I love, and thinking about things that I’m thankful for. Our funny boy. He’s just…the best. He’s hilarious and adorable and surprises me every day with new things he can do, or tries tirelessly to do. These days more than ever, my ribcage bursts with how amazed I am that he is mine, and he is so cool. Family. As always. The family that I had around me growing up is now around via Skype (and also, I’m thankful for Skype), and the family I have here in Denmark is great. We’re celebrating Thanksgiving all together, which I am just so excited about. I don’t know a single person who has been as lucky as I am in the in-law department. Andreas–because I’ll never not be grateful for finding Andreas, and getting to keep Andreas. Friends. Old and new. I love my old friends, the ones I can contact after weeks, and it’s just like old times, the ones I plan to see, the ones I have Skype dates with, and even the ones I hardly speak to anymore. I’ve had amazing friends over the years. And I’m super thankful for my new friends in Denmark. And for new friends that are starting to feel like old friends. And also, thankful for the television show Friends, which remains awesome, and which I watch on a near-daily basis. Mini-marshmallows finally being findable in Denmark! Duolingo. I love learning, I love language, and now, I love Duolingo. I’m refreshing my Spanish, starting with German, and doing some of the Danish just for fun. That’s the short list, and I know it’s mostly generic–who isn’t grateful for their friends and family? But it’s Thanksgiving, and it has to be said! I’m preparing now for the 10-person (children included) dinner I’ll be making on Saturday. I’m doing lists, prep work, planning–the whole nine yards. It’s not that I need the dinner to be perfect, but…I just really like planning for things that I’m excited about. So I’m putting my apron on the packing list, and charging into Thanksgiving with all engines firing! HOORAY THANKSGIVING! This blog has definitely been waysided lately, but I wanted to update, so it’s not lost for good! But things are good enough that we don’t feel super rushed to finish the last few things. We’ve had some amazingly relaxing weekends lately, hanging around the house, and even though the weather has been mostly gray, gray, gray, it’s actually made family weekends at home together that much more cozy. Job searching is nor bearing any fruits, not even a flower of an interview, but I’m still looking, still applying. It’s impossible not to be disappointed and discouraged at times–sometimes really disappointed and discouraged. But bouncing back is the important part, and I know it’ll be alright. Theo starts daycare in about a month, and I’m sad that this stage of our life is over. And of course, I’m feeling guilty that I don’t have a job yet, and it will feel like a waste to give him to someone else during the day. But I’ll just hope it all works out, and do my best. For now, my coping strategy is to mostly not think about the fact that he’s going to daycare. And when that doesn’t work, try to focus on the fact that Andreas is going to take a day off so that we can have a date–alone–together. Something that has happened twice since he was born. And speaking of Theo, he’s doing really well. He’s not really talking yet, but he’s busy being his hilarious self. We laugh now, so much more than we ever did before. And now that he’s been sleeping well for a while, we know it’s not from the deliriousness of sleep deprivation. Theo is just funny. From the silly things he puts in even sillier pieces (garlic in the heating vent, his sleep-duck in the corner of the kitchen closet, my pearl bracelet in his Winnie-the-Pooh car, etc.) 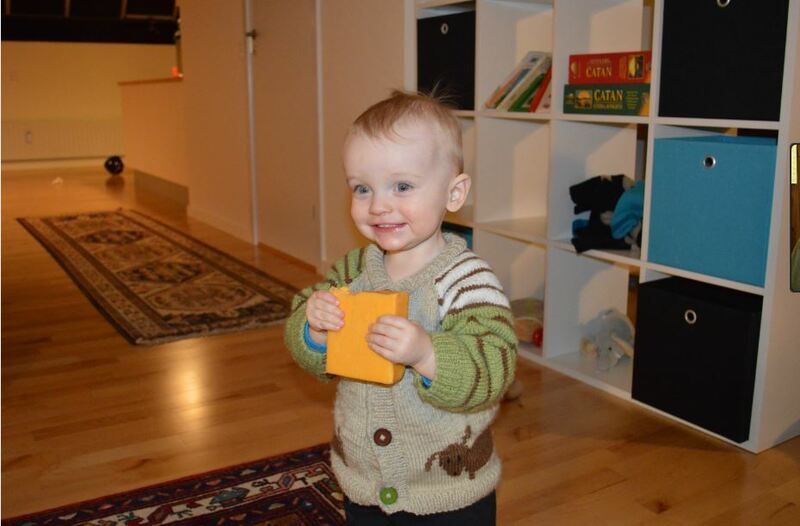 to him waltzing into the living room munching on an entire block of cheese, he’s just funny. I think I’ll do a photo post soon, with more updates, but I just wanted to say hello again before it gets too cobwebby over here. We’re celebrating Thanksgiving this coming weekend with Andreas’ parents, two sisters, and one sister’s husband and two kids (plus a puppy! ), so I’m naturally SUPER excited for such a big, family Thanksgiving, and have to start meal-planning, shopping, prepping, etc. So I’ll be back soon, hopefully more regularly!